Today, I read an article by Rick Warren. He talked about spiritual growth. As I read it, I felt encouraged to grow more spiritually, but I realized that although he talked about growing spiritually, he didn’t mention how this would happen, specifically. This was one of the key scriptures that he mentioned. I’ve thought of this scripture often times when I think about growing. We have a job to do in the growing. From my experience, it, partially, has to do with a change of mind and a change of actions. We have to begin to look at our thought patterns and ask ourselves, do these thought patterns line up with what I believe, with the word of God, and with the life of Christ. When we find a point where they don’t, we must be very active in changing them. From there we have to be proactive about producing positive thoughts that line up with who we are spiritually. We have to tell ourselves things like, “I can do all things through Christ Jesus who strengthens me.”(Philippians 4:13 ) We have to “cast down every vain imagination that would rise up against the knowledge of God”(2 Corinthians 10:5) in our lives, to include who He is and what He has enabled us to do. In changing these thought processes, we have to say these things out loud so that we can hear it. Those words will stop us in our tracks and help us to begin to make changes. Then we must begin to line our actions up with the word of God, what we believe, and the life of Christ. We have to begin to observe our actions and ask, do my actions line up with who I am spiritually. If not, we must take the steps necessary to change them. I remember a specific point in my life where things were really hard. My relationships were in trouble, I could not get where it seemed that I needed to be in my career… and spiritually…I was drowning. I had decided that I was going to do all that I could to grow in every possible way. So I built myself a spiritual emergency kit. Now in the natural, there are certain things that I keep with me all the time, especially when I leave home…my phone, my keys, and my wallet or purse. Because I was trying to grow, I found that there were certain things that would help me spiritually and I could depend on them all of the time, so I kept them with me… my bible,my prayer journal, and my promise bible. I could be found at any given time with these in my possession. If we went out to dinner and I got a little frustrated, which I did very often at this time in my life, I would pull out my promise bible and read the promises that pertained to stress. I would have these items with me as I watched tv, visited friends, and went to the grocery store. I remember being asked why I brought my bible with me everywhere. What the person asking did not know was that I was on a mission and my biblical survival kit was my life line. If I felt that I couldn’t hear from God in a specific moment because of my emotions, I could see the words on the paper. Over time, this action changed my thought process and my thought process changed me. I relied on God more than I ever had in my life and through viewing His word all day, especially when emotionally weak, He changed me. Do you see an example of what it looks like? Now I have to admit that at every point in my spiritual growth, it looks differently. I no longer need to read my bible at dinner because I’m different. Now the word of God arises within me and I make choices based upon what I know to be right in God’s sight, but I still need His word. It is life changing. The practical steps that we take in our lives to grow must be intentional, purposeful, and continual. 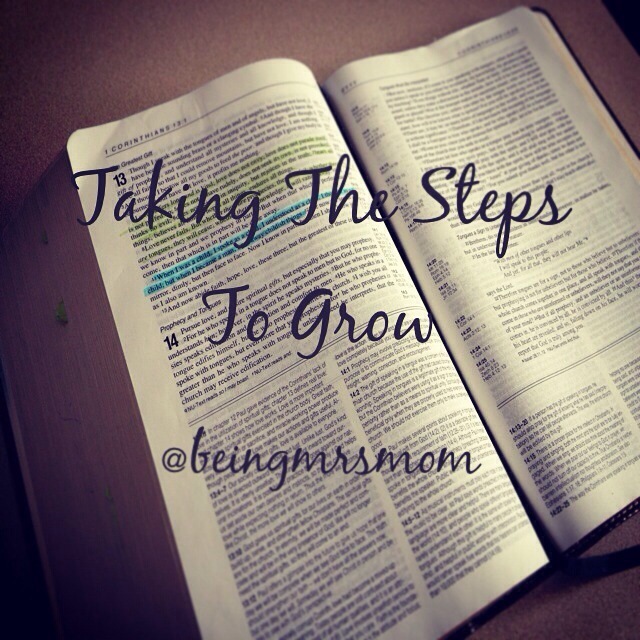 What steps are you taking to grow spiritually? Have you changed the things that you do over time because you find that some work better than others or are you stuck and need ideas? There is a normal cycle in our human existence. We all go through a span of life development. We are born into this life as a helpless baby. We mature into a child, adolescent, and adult. Even our adulthood is filled with a maturing process. We go from being young adults to middle adulthood. Finally we become an elder. While this process is a natural one, there is also a spiritual process of development that we all must go through. Yet there is a slight difference in the two. The natural process of development takes place without our participation. Every year we grow older, age, and change. Life’s situations and circumstances cause us to develop, even in our minds. Our brains change, developing the essential qualities needed to live a healthy life. Yet, the spiritual process is not the same. As an adult that is a newly saved Christian, we are a new creature in Christ. This means that we are born again and a babe in Christ. After spending time in relationship with God through His word, we begin to mature. However, this process of maturing requires more than what is required in our natural lives. What I mean is that as a Christian ages, this is not equivalent to their level of spiritual maturity. However God calls us to a place in Him where we go from being a child in Christ to being a young man or woman in Christ. After that it is important that we begin to mature into an elder in the body of Christ. In the body of Christ, new babes are always being born and we are called to help train them for service and for their lives in this earth. (Titus 2:3-5) Yet we cannot do this if we stay babes ourselves. This process of becoming spiritually mature requires our participation. In the scripture above, Paul distinguishes some of the changes that take place. He says that when he became a man, he put away childish things. We must put away from us speaking as a child. We must be willing to take the time necessary to acquire the understanding of a spiritually mature adult so that we no longer understand as a child. Even our thoughts have to change from being childish to being spiritually mature, thinking on the things that are pleasing to God and replenishing to our spirit. This is one of our first steps. We all want to be our best. We want to be good wives, mothers, daughters, friends, aunts, sisters, cousins…you name it…we want to be our best. If we want this, we have to do what it takes to be that. We have to afford ourselves the opportunities to be our best. Yet, when we do not pursue the things of God, we rob ourselves and those in our lives of experiencing us at our best. I hope this message comes across in a way that blesses you. I have found that being my best means saying no to some things and yes to others. I have to trust God at His word and do what He says, so that my life can be a reflection of His love. It might be challenging, but when we look back and see how far we have come, it will all be worth it. As we bring this week to a close, let’s think about the things we can change in our lives. What are new habits to build and old ones to break? How can our relationship with God and others be better? What is our relationship with the Word of God? Basically, let’s do some evaluating so that we will be ready tomorrow to start a new week, moving forward spiritually.